A mosquito net is difficult and annoying to use. If you have camped in a pup tent, then you many be able to empathize with people who are supposed to be using a mosquito net. There is just no way to get in and out of a one-man tent simply. To protect yourself from mosquitoes you need to unzip, jump inside, and re-zip the net very fast. Then suffocate from the heat. I was in Niger last year, I thought I had Malaria, on hindsight, I may have had Paludisme, I mean food poisoning. The situation was this, I was very sick, I kept saying to the Niger people, what I thought was the word for Malaria; I said, Malaria, the people would agree or disagree with no problem. I realized later, I was saying Malaria, and nobody knew this word. 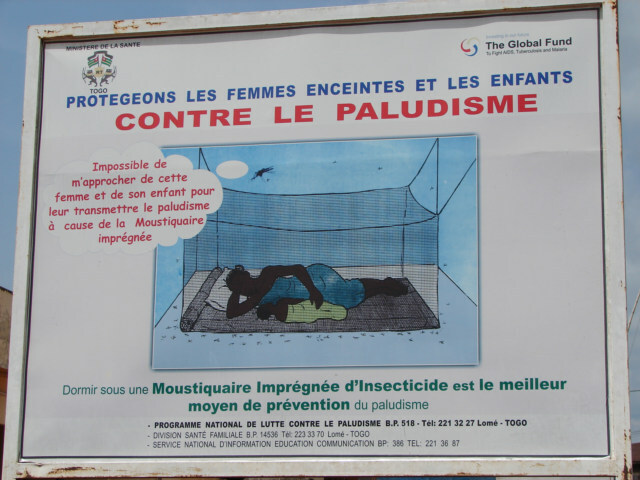 I need to say, Paludisme the French African way of saying, Malaria. There are some good sign boards about Puludisme in this area of Togo; the villages along the road to Adeta were promoting the fight against Puludisme. I am not sure; sleeping under a mosquito net is difficult, annoying and fraught with methodical and procedural flaws. The goal is to not be bitten by mosquitoes. This is an almost impossible goal to achieve. I know one thing; I am not going to take Malaria pills for 75 percent of my life. I live in the Tropical Malaria - Puludisme areas of the planet at least 75 percent of the year. I will cultural reinterpret this statement. No, I do not sleep under a mosquito net, I know I am supposed to; I would like to sleep under a fan because the fan blows the mosquitoes off me. However, the truth is, I do not have a fan, and there is not electricity most or about half the time. Therefore, even though I know I am supposed to protect myself from Mosquitoes so I do not get Malaria or Puludisme, I just cannot be bothered. It is too hot, too difficult and I would rather just deal with them, rather than worry about Malaria. Plus, I am too cheap to buy one. I can about count the number of times I have seen a person in Malaria prone areas sleep under mosquito nets. I see them in Tourist hotels; however, the normal population seems to avoid them. I guess on the Amazon River in places they used them a few times. In Niger, they have this cool sleep outside bed set-up, which is more or less the Hausa bed, it has a mosquito net. Still, the goal is to not be bitten by a mosquito, the goal is close to impossible. - Unless you go into a mosquito net with a bottom, zip is shut, and start to sleep at about 5:00 or an hour before sunset. A mosquito will bite through the bottom of a hammock. They can find the small hole; I was looking at a mosquito net in the Turag area of Agadez, Niger one time. The net was over the short stick homes as was supposed to protect a baby. I could see rips in the net everywhere, a mosquito net is delicate, and it rips easy. Truthfully, DDT is probably the answer. The real solution seems to be to install screens on the windows by professionals. I was sort of thinking in Kpalime, I was in the L’Aurore hotel for one night; the place had very good screens on the windows. I entered the toilet and shower area and this small window above the toilet was just bars with No screen over the windows. Almost Africa. I thought to myself, this is not going to work, so I closed to the toilet and hoped they had not already entered. I was in the Bafana Bafana before that, and there were no screens on any of the windows. It took some work, but I put up my mosquito net and slept under a blanket. Sleeping under a mosquito net is like sleeping under a blanket; it almost successfully stops the breeze or fan, not completely, but close. Why rooms do not have hooks on the walls for me to install a mosquito net? Ok, I am in this 2000 CFA room in the middle of nowhere, on the planet with Malaria. This funky little room has nails in the wall, I am wondering, was it for pictures or did someone, sometime actually set up a mosquito net? I always carry a mosquito net; I do not use Malaria pills, although setting up a Mosquito net in most rooms in is an Act of God, very difficult and complicated. You can tell the serious people, they have a bed with four poles, and then you can hook a mosquito net on each of the four poles. I was cracking up laughing at Mawuli in the Auberge Mandela. The room was sealed tight, a very good room, and the number 4 room I think. Well, I decided to extra kill off the fleas, ants and anything that moved. I closed the doors and windows, before I was going to start living there. I started to gas the place with the insect killer called Killit, the cost is about 1000 CFA. I did not Almost Africa is, I was doing a German quality job. I was trying to kill everything in the room, I sprayed every crack, crevice and place a flea or mosquito, or my arch enemy ants could sleep. Mawuli came and sticks his head in the room and sort of signs me to stop. I am thinking to myself, you are slow in the head, please take you vitamins. I was at the toxic level of breathing and they were outside and he and this girl Essay could smell it, it was annoying them. I thought to myself, and wanted to holler. A little annoyance can bring Africa to a stop. I did not stop, I used the whole can, and thought, I did not Almost Africa that, I did a German style job of killing. I have this very long pull string on the bottom of my mosquito net. I pick up the four corners of the bed; place the mosquito net under the edges. I then can pull the draw string. As best I can tell, a normal lie on the edges type mosquito net does an almost job, but does not stop them. Then my next problem is to enter the bed, I need to loosen the drawstring, and then climb under it, annoying and difficult, but I do not like to be bitten, I am not so worried about Malaria, I just do not like to have mosquito welts on my body. I like to sleep peacefully. In addition, it keeps the cockroaches from crawling over my bed and rats from defecating on me as I learned in Pak Bara, Thailand as they crawl in the rafter of my bungalows. But, it is hot, difficult, and if I had a fan, that was full steam ahead, a good blow, I would maybe think about not using this net and go for the fan, but I know, that would almost work, but not really. I like to ask people if they carry a mosquito net. The will buy the malaria pills, but are too lazy to carry the mosquito net, but it takes more thinking to set up a mosquito net than to toxic yourself with Malaria pills. I am sort of musing now, I am thinking, how I can modify this net again so I can have a zipper opening, so I can climb in and out easy. It is possible; I just make a big pull string opening, as a door. I added these carabineer things to the corners the other day in the Bafana Bafana so I can take the long nylon cords off the corners so they are not tangled. I also use them cords for other jobs, like typing my bag on the bottom of my pack. I have to admit, this mosquito net is getting better all the time, as I keep engineering in other ideas. There are tons of tailor shops here, I sometime hope I am required to use this mosquito net for a few weeks. I would be more inclined to make the modification and not forget until the next time I am under this blanket. It is cooler here at 757 meters or something like that, but not enough, it rained and then stopped. I keep thinking, when I enter an expensive hotel and they have mosquito nets, I am worried. A much better system is to install screens on the windows, mosquito nets are uncomfortable and meant for cheap hotels. I truthfully think they would do better to install screens on all the windows of the home here, probably would be as effective as trying to put nails in clay adobe walls, and expecting them to hold. The fundamental problem is the rooms, homes, and bed are designed wrong, the root problem is in the design of what is need to hang the mosquito net. Then the mosquito net, there is many adaptations needed before I am happy or through with this baby. For those who pay a fortune for mosquito nets in a gear shops, they cost about 3 dollars in Thailand.